While known today primarily as a prolific hymn writer, Fanny Crosby (aka Fanny Van Alstyne and Frances Jane Crosby) was also an influential figure in the “rescue mission” movement of the late 19th century, notably in New York City where she lived most of her adult life. Ecumenical in spirit, she belonged to the Methodist Episcopal Church but spent some years taking part in Baptist and Presbyterian congregations. Her hymns were influenced by enthusiastic Methodist singing. 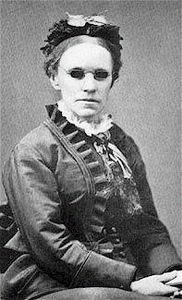 Blind from childhood, Ms. Crosby wrote the words to more than 8,000 hymns. Favorites include “Safe in the Arms of Jesus,” “Rescue the Perishing,” “I Am Thine O Lord, “To God Be the Glory,” and “Blessed Assurance” (co-written with Phoebe Knapp). The United Methodist Hymnal has seven hymns by her. Ms. Crosby married a fellow teacher, Alexander Van Alstyne, in March,1858, who was also blind. Their only child, a daughter, died soon after birth. The marriage did not flourish, and the couple lived apart from 1880. She lived at various locations in Brooklyn and Manhattan across the years and was often on the edge of poverty. Publishers paid poorly for hymn texts. Along with her friend Phoebe Palmer, the founder of the Methodist holiness movement, Ms. Crosby helped to promote the “rescue mission” (also called “city” or “gospel” mission) movement, an international, non-denominational phenomenon aimed largely at lifting the poor, often migrants in the late 19th and early 20th centuries. Some institutions she championed, such as the Bowery Mission in New York City, founded in 1879, still operate today. In 1907, Ms. Crosby moved to Bridgeport, Connecticut to care for a sick friend. She died there in 1915 at the age of 95. Her commitment to mission went with her to Bridgeport and lasted for many decades thereafter. She left funds in her will to start a home for homeless men in the Connecticut city, a bequest enlarged by fund-raising by the women of the First Methodist Church and the local federation of churches. The Fanny Crosby Memorial Home for the Aged operated from 1925 to 1966, when it was merged into the Bridgeport Rescue Mission.